BLU: HOME Guesthouse is a new member of the BLU family. Sporting the same industrial and modern vibe as the other branches, BLU: HOME let's you know immediately that you're in the place you want to be. BLU: HOME boasts a free breakfast in a spacious mini kitchen on the second floor, along with our reception. Then as you continue upwards, you'll find the computer lounge and big screen TV in our large common room. Please do not make a reservation Korean. BLU: HOME is very close to a young and lively party district full of bars, clubs, shopping, restaurants, and coffee shops. Walking to and from the exciting nightlife is easy, but the HOME is far enough away where you're still guaranteed a good quiet night of rest. Airport Limousine Bus: 8 minute walk from airport bus stop to BLU: HOME Guesthouse. 1) From Incheon International Airport street level bus stop 5B, 12A, take AIRPORT LIMOUSINE BUS #6002 into Seoul (10,000 WON). You'll get off at the HOTEL SEOKYO stop (trip takes about 40 minutes, it's the second stop from the airport). The bus stop is on the median. 2) Cross the street toward Hyundae, Dodge Auto Dealer (it's small, so look for it). Turn right and walk 170 meters toward the SC bank. 3) Turn right at the CS Bank. Go straight for 120 meters until you see the Paris Baquette Cafe on your left. 4) Turn left at the Paris Baquette and walk straight for 230 meters until you see another 7-11 on your left. 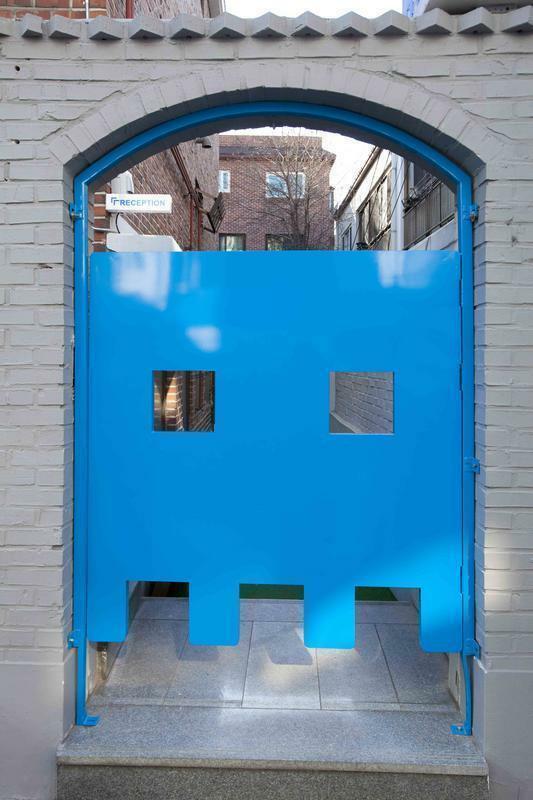 5) Turn left and walk for 45 meters until you see our bright blue gate! 1) get off at Hongik University Station and find exit #1. (the A'REX station and subway stations are connected via a long passageway). 2) get out of exit #1 and walk straight for 1 block. There will be a construction site on your right and an SC bank across the street. 3) cross the street toward the SC bank. 4) Turn right at the SC bank and walk for 80 meters until you see the Paris Baquette Cafe on your left. 5) Turn left at the Paris Baquette and walk straight for 230 meters until you see another 7-11 on your left. 6) Turn left and walk for 45 meters until you see our bright blue gate!